Anyone who has grown up watching Hong Kong movies, like myself, would know how to appreciate Wong Jing’s trademark nonsensical “mou lei tao” (Chinese slapstick) humour and over-the-top illogical sequences, but it’s also a problem when we’re too familiar with his work. Although I didn’t take From Vegas to Macau‘s plot too seriously, I find Wong Jing’s typical cliches a little bit tiresome and because he’s been doing it since forever in his films, it becomes expected, as though we’re supposed to still like it today. 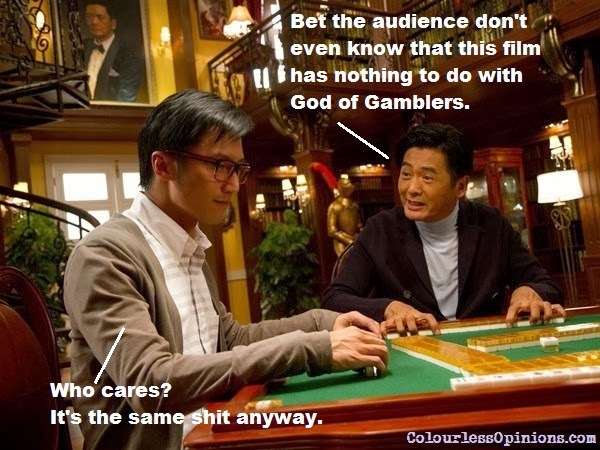 First of all, let me just clarify that this film has nothing to do with the God of Gamblers film series (well besides the little cute surprise at the end), so don’t be fooled, Chow Yun Fat is not playing Ko Chun (the titular protagonist of God of Gamblers) in this story. Instead, he plays “Magic Hands” Ken, a legendary gambler who became a Vegas casino security consultant. His help is needed when Cool’s (Nicholas Tse) brother, who’s an undercover police, got murdered by Ko (Gao Hu), the evil boss of an illegal gambling syndicate. As expected, there are scenes with Ken going head to head against the antagonist at the table complete with over-the-top card shuffling done by trademark cheap CGI, but the ending is disappointingly without a proper one, making it sort of anti-climatic. Never mind the things that are left unexplained (like how Cool knows how to fight so well, how Ken and the villain are able to change cards when gambling, and who’s the wife-like lady following Ken around in only some of the scenes), it’s a typical senseless Hong Kong comedy anyway. But the problem is Wong Jing ripping off from previous films, he just can’t stop recycling his old ideas. If you’ve seen and remember the God of Gambler films, The Conman (1999), The Conmen in Vegas (2000), The Tricky Master 2000, etc., you will notice the typical cliches like faking a football match, character suffering amnesia, the mention about how outdated “x-ray glasses” are now and so on and so forth, you’d know the drill. On top of that, although there some intentionally hilarious moments, most jokes in the film are overly cheesy. Perhaps “mou lei tao” just don’t work anymore? It’s surprising that this is the finalised script that was revised 8 times. Mainland actress Jing Tian (Special ID, Police Story 2013) has been appearing in almost every Chinese movie I’ve seen recently and am I sick of her already? No, it’s hard to resist a gorgeous, flawless fair-skinned babe, regardless of her performance, role or lack of bust. Having her here for yet another police role is definitely a plus point for general male audience. Kimmy Tong is still an unfamiliar face to many (or to me at least), but she’ll definitely be noticed now, but not due to her performance as Ken’s hot daughter and Cool’s love interest. Censorship in Malaysia: Can’t recall if there was any scene was awkwardly skipped at the press screening. So… I think it’s rated ’18’ here just because there’s gambling? Second opinion: “Very Wong Jing, and yet not very Wong Jing,” my girlfriend’s exact words, which I believe she would’ve disagreed with if she still remembers all of the previous Wong Jing and God of Gamblers films. Verdict: Not as great as the classics and cliched with expected over-the-top gags, but very watchable when in festive mood. 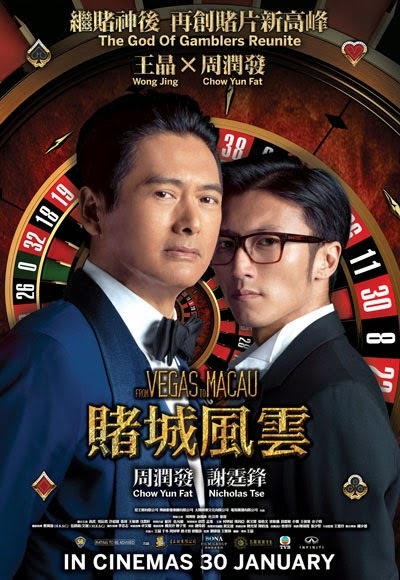 Synopsis: From Vegas to Macau is an upcoming Hong Kong crime action comedy film directed by Wong Jing and starring Chow Yun-fat, Nicholas Tse and Chapman To. 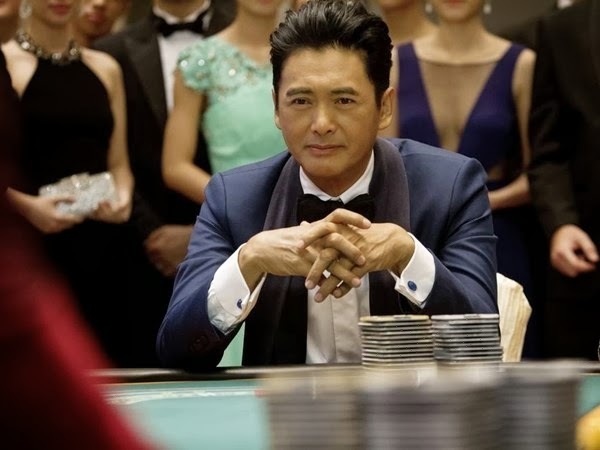 The film is the fourth installment of the God of Gamblers film series where Chow will reprise his role as the titular protagonist once again since 1994`s God of Gamblers Returns.